Trains running across noth, northwest and eastern India were affected by dense fog. These include places in Bihar, eastern Uttar Pradesh, and isolated places over Punjab and Haryana. 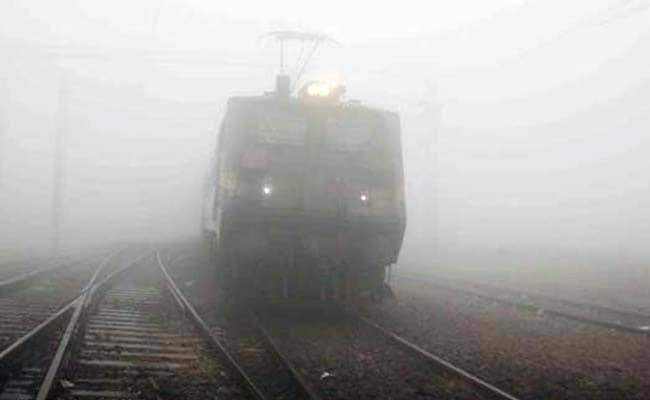 38 trains are going to arrive late, while seven have been rescheduled and fifteen cancelled due to dense fog in the Delhi and neighbouring regions in north India. Residents of the national capital and adjoining cities of Noida, Gurgaon, Ghaziabad and Faridabad woke up to a foggy morning. The minimum temperature recorded at Delhi's Palam station this morning was 8.1 degrees Celsius, three notches above the normal temperature for this time of year. The lowest temperature recorded at the weather station in Delhi's Safdarjung was 7 degrees Celsius. Trains running across noth, northwest and eastern India were affected by dense fog. These include places in Bihar, eastern Uttar Pradesh, and isolated places over Punjab and Haryana. At 25 metres, the lowest visibility was observed in UP's Bahraich and Gorakhpur, while Amritsar, Hisar and Patna had visibility at 50 metres. Visibility in Delhi was lower than 200 metres. According to the weather department, Delhi will have a clear sky with moderate fog and medium visibility through the day.